Albert Burneko is off. Your guest Foodspin columnist today is clean person Jolie Kerr. The existence of this corn relish was inspired by two things: my inherent cheapness, and the compulsion I have about keeping a tidy-looking icebox. Oh, well, and one other thing: I was in charge of bringing the steak salad to a recent luncheon and wanted to tjuz it up. By "luncheon," I mean three of us sunning ourselves on my friend's deck while getting tanked on white wine at noon on a Sunday. Not exactly a cloth-napkin affair. Still though, serving a tjuzed-up steak salad needs no real excuse in my mind. Corn relish is an under-appreciated condiment, I think. It's a real, real Southern thing—almost a salsa, sort of a dip, entirely delicious. I'd put it in the same family as chow-chow or piccalilli, in that they're all semi-sweet vegetable based relishes. 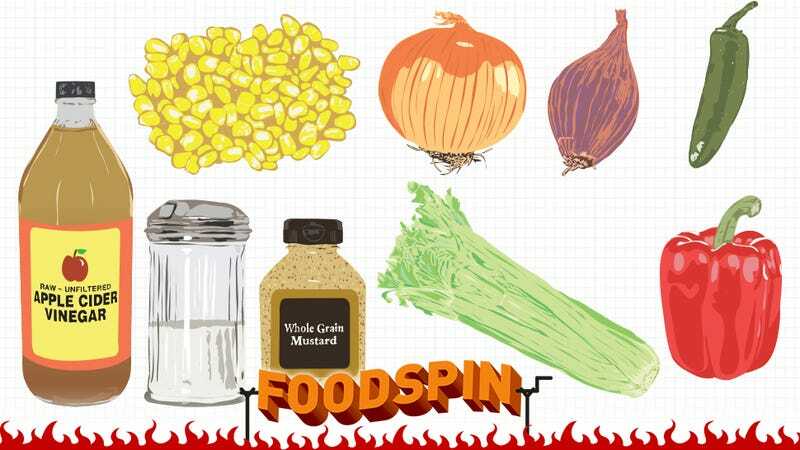 At its most basic, corn relish consists of corn kernels cooked with bell peppers, sugar, and vinegar. Maybe a peppercorn or mustard seed tossed in for good measure/flavor. There are, of course, a million (rough count) variations on it. It's also a thing that is almost always canned and put up. That tidbit will become important later. There are many commercially available corn relishes, sometimes called corn salsa, which might be helpful to know about. (Trader Joe's makes a good one. It's really good in salads of all stripes. Just a lil' tip from me to you, friend.) But honestly? For the absurdly small amount of work and time it takes to DIY this stuff you might as well make your own and revel in the praise your friends, lovers, enemies, et al inevitably will bestow upon you when they taste the fruits of your labor. That TJ's corn stuff was essentially what I was aiming to replicate at home, because I had a box of frozen corn lingering in my freezer, as boxes of frozen corn are wont to do. To the Google I went, first searching for "corn relish recipes" which seemed like a promising set of keywords. It … wasn't. This was where I ended up and wow that sure does look delicious but it yields 12 PINTS and I do not live on a prairie, I live in a tiny box in the Manhattan sky. I do not have any sort of space in which to put things up, as the saying goes. Bring vinegar, sugar, salt, mustard and the vegetables you're using to a boil in a medium saucepan; reduce to a simmer and cook, stirring occasionally, 30 minutes. THAT IS ALL. It's, like, stupid easy to make this stuff and the recipe is insanely forgiving. You'll notice that the vegetables I used are on the hodge-podge side—I dug up whatever was in my crisper drawer. You should do the same! You can, of course, use a different kind of vinegar if you'd like. You can use a different kind of mustard—I liked the grainy stuff because the mustard seeds gave the thing a nice appearance and I am vain. And also because it allowed me to use the final dregs of a jar of mustard that was, to be frank, a disappointment. Man, I hate a disappointing mustard. I'm such a collector of mustard; I don't even want to tell you how much time I've spent puttering around on the Mustard Museum website. Actually maybe I do want to tell you about how much time I've spent puttering around on the Mustard Museum website. I feel like you might understand completely. It&apos;s weird that we fight about chili. This is the worst time of year. Taste Test: Will Dorito-Sheathed Tacos Be The End Of Us All? Taste Test: Popeyes Rip&apos;n Chick&apos;n. Who Thought This Was A Good Idea? Taste Test: Uncrustables. What Does The Crustless PB&J Say About Us? Jolie Kerr is the author of the upcoming book My Boyfriend Barfed In My Handbag … And Other Things You Can't Ask Martha (Plume, February 25, 2014); more of her natterings can be found on Twitter, Kinja, and Tumblr.